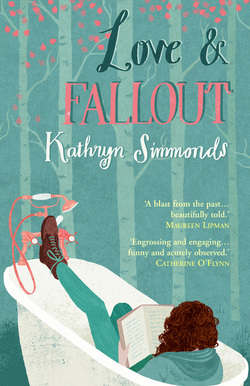 Kathryn Simmonds has published two collections of poetry, Sunday at the Skin Launderette (2008) and The Visitations (2013), and her short stories have appeared in magazines and been broadcast on BBC Radio 4. Love and Fallout is her first novel. In 2013/14 she was poet-in-residence at The Charles Causley Trust. She currently lives in north Cornwall with her husband and two young daughters. The overriding emotion is relief! It’s also slightly unreal – but exciting – to know that this story, which was a pile of re-written chapters for so long, is now available for people to pick up and read. A large chunk of Love and Fallout is set in the women’s peace camp at Greenham Common in the early 1980s. What drew you to this aspect of recent British social history and why do you think the protest is so underrepresented in fiction? Greenham provoked such strength of feeling and I just found it a compelling era to investigate. Although peaceful, the protests were intrinsically dramatic – there was conflict between the women and government, between local supporters and those who wanted the encampments gone, and then there were the headline-stealing ‘actions’ themselves, such as Embrace the Base. Group dynamics intrigue me, as do friendships between women, and if character is revealed under pressure then I had a lot of opportunity to test my naive heroine, Tessa. As to why Greenham is so underrepresented in fiction, it’s difficult to say. Perhaps it’s not far enough away yet to be thought of as history ‘proper’, but actually what interested me was the fact it’s within living memory, that thousands of women not only remember the protests but were involved. Writing the book made me question who makes history, who decides what’s noteworthy and what isn’t. The novel also contrasts constructions of feminism between the early 1980s and the present day. Do you think the position of women has changed much in the last thirty years? That’s a huge question! You only have to switch on the news to see that millions of women are having a terrible time – and women in this country should have no complaints by comparison, but…there’s still a but. The same discussions rumble on about childcare provision, equal pay, even that sad old cliché Page 3, and there are still issues about how women see themselves represented (or not represented, especially if they’re older). In the book I tried to be playful with the subject and contrast Tessa as a 19-year-old in the 1980s when there was a ‘second wave’ of feminists who were quite active, with her daughter in the present day who finds the term feminism irrelevant and embarrassing. But the wheel is turning and younger women are embracing feminism again. During my research I did a lot of reading and thinking around all this, but I didn’t want to shoehorn anything into the novel so my approach is fairly light. I thought you’d pitched the tone of Love and Fallout perfectly for the topics: it was humorous without being mocking and serious without being preachy. Did this voice come naturally to you or was it something you had to work at? Thank you, it’s nice to hear that from a reader. I didn’t want to write a satire, but equally I was desperately trying to avoid writing something ‘worthy’, so in the end I just had to follow my instincts and chart Tessa’s journey. Tessa stumbles towards the camp from the suburbs and doesn’t really know anything about what she’s got herself into, which meant I could view everything through her eyes. Novels have to be about character – no one goes to a novel for a sermon. I wanted an entertaining and absorbing read, and humour is part of life so it felt like a natural part of the book. What did you most enjoy about writing Love and Fallout and what did you find most challenging? I loved the research, it was fascinating and at times I’d get lost and forget I was supposed to be writing a novel at all. And it was so interesting to meet people who’d visited the camp or lived there, and to hear their stories. The challenge was piecing everything together. My writing background is poetry (no plot required), and I’ve written some short stories (plot optional), but what I love about novels is a story. The narrative takes place in two time frames, the present and 1982, so it was essential that these chapters spoke to each other and felt part of a complete whole. You’ve had two volumes of poetry published by Seren, how does your writing process differ for poetry versus prose? Do you have any particular novel writing tips or quirks? Poems are portable; you can hold them in your head. When I’m writing poems I’m able to work on four or five at the same time, laying one aside and coming back to it later, and if something’s not working it might go in the bin. By contrast, it’s harder to put 30,000 words in the bin. The only secret I learned was to keep going, to resist that urge to say ‘this is terrible’. It helped to remember that the reader would only see the finished book – not the piles of drafts heaped up under the desk. The other thing I discovered was that I had to keep in the story, keep working on it consistently or it would go ‘cold’ and be difficult to re-enter. I read something Anne Enright said in an interview: ‘Writing is mostly a case of mood management. The emotion you have is not absolute, it is temporary. It may be useful, but it is not the truth. It is not you. Get over it.’ I love that – ‘Get over it’. She’s right. Writing can be, (has to be), an emotional experience, but you can’t be dictated to by your moods. So just get over it and get on with it. I don’t know about bad advice, but certainly there’ve been a few unhelpful comments – mostly from editors who turned the book down. One that sticks in my head is: ‘I don’t know who this book is FOR’ (editor’s capitals). Well, it wasn’t for her! But it reminded me that you have to keep focussed and keep going; you have to have faith and believe your book will find its readers. My second poetry collection came out last year, and the novel this year, and my new baby arrived in the summer, so I’m having a bit of a break. I have an idea for another project but sometimes it’s more useful to stop and enjoy the stuff of life. The Prime of Miss Jean Brodie: slim, smart, witty. Where do you get your ideas from? (Just kidding). You'll find my mini review on my blog where comments are welcome.